Beáta Rostás was born in Hungary, Eger, on the 16th of August 1979. She finished University of Art in Pécs, Hungary as a sculptor in 2004. Her professional successes were awarded already as a student with Republic Grant and scholarship of Heves county and Eger city. Since then, her plastic „ Mother of Earth” was awarded in 2009 in Serbia on the International Women Artists Exhibition as „Best Ceramic Plastic”, and her big granite statue „Anyácska/Big Mama” won 3rd price in Lithuania on the Vilnoja Symposium. In 2011 she won Prima Primissima Award in her county. Rostas is member of the most important Art Societies in Hungary and also some foreign Associations of Art, like Aiesm. Her works has been presented on 19 individual and 50 group exhibitions in many countries. After graduation she worked in Pécs at Contemporary Art Societies, but left everything behind to focus completely on her profession. From 2012-2016. she is a PHD/DLA Doktora Student of Hacettepe University, Sculpture Department in Ankara, Turkey. 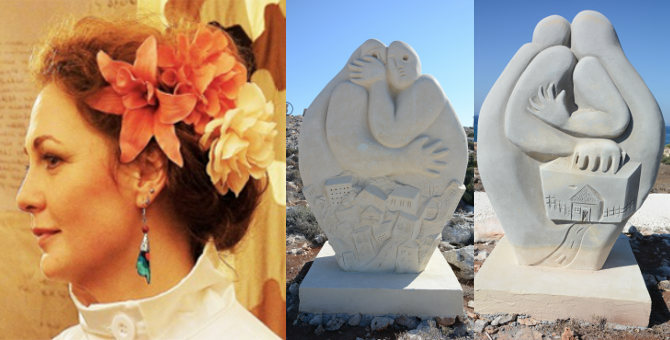 Since 2004, she participated on 41 International Sculpture Symposium, on stone in the United Arab Emirates, China, Oman, Iran, Spain, France, Greece, Italy, Romania, Lithuania, Cyprus, Hungary, carved more times in Egypt, Russia, Germany, Turkey, the Czech Republic, Slovenia, Austria, worked with terracotta in big size in Serbia and Turkey on symposiums, with snow in Turkey, Erciyes, and with straw in Turkey,and Croatia. In the past 12 years, she carved 41 large outdoor statues around the World. Title of the project: "EXILES"
Concept: Man and woman strongly connected, embracing each other. Man is trying to protect his woman, not to see any trouble, just hold the baggage and go forward, leaving cities, countries, until they find their place, their home. Our body is our home, the house and the place of all , where we can be with our family. Home is where your beloved ones are.